If you opened up your Postmates app and saw a well-known fictional restaurant available for delivery, you’re not alone, as fans of both Breaking Bad and Better Call Saul noticed something odd taking place. For a limited time only, the logistics service is offering free delivery from Los Pollos Hermanos, the fast-food chicken franchise from two of AMC’s most popular TV shows. 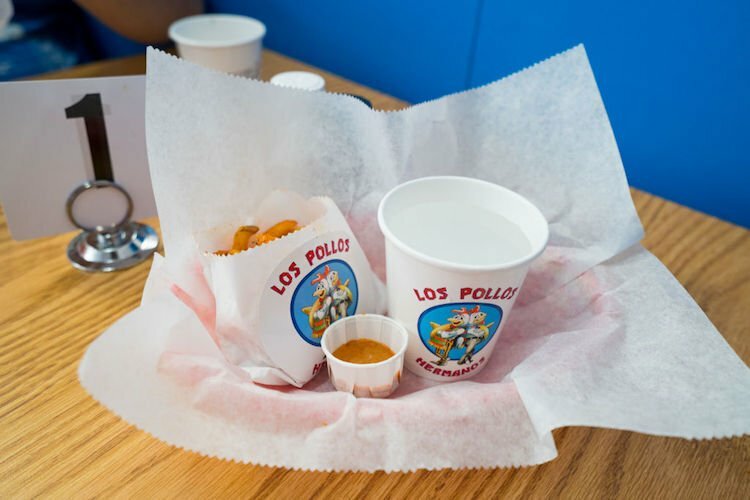 This isn’t the first time AMC has brought Gus Fring’s restaurant to life, as the network promoted season three of Better Call Saul last year with a pop-up Los Pollos Hermanos in downtown Los Angeles, which was, of course, subsequently mobbed by Walter White fanatics. This time around, AMC teamed up with Postmates in an effort to avoid the overcrowding by bringing the Los Pollos Hermanos famous fried chicken and curly fries directly to people’s doors, assuming you live in New York City or Los Angeles, of course. Daily chicken deliveries will begin at noon, though you should probably act quickly if you want to score your free “mini-meal” as supplies are expected to be somewhat limited. And don’t expect any other deliveries inspired by Walter White or Jesse Pinkman with your chicken either, if you know what we mean, blue dreamers. Otherwise, you better call Saul.